PUTRAJAYA • Malaysia's Prime Minister Mahathir Mohamad has said he wants to increase the price of raw water supply to Singapore by more than 10 times to reflect the higher cost of living. The current water agreement, which expires in 2061, sees Singapore drawing up to 250 million gallons a day (mgd) of raw water from the Johor River, and Johor entitled to 5 mgd of treated water from Singapore. Singapore pays 3 sen (1 Singapore cent) per 1,000 gallons of raw water and sells treated water back to Johor at 50 sen per 1,000 gallons. Singapore has said this price is heavily subsidised and below the cost of treating the water. Malaysia chose not to review the price when allowed to in 1987, but talks took place when Tun Dr Mahathir, who was then prime minister, raised the issue in 1998. The talks did not result in a new pact. In an interview with the Associated Press published yesterday, Dr Mahathir said Johor sells raw water to another Malaysian state Melaka at 30 sen per 1,000 gallons, which he described as "charitable". Since his comeback as the world's oldest prime minister after leading the Pakatan Harapan (PH) coalition to victory in the May general election, Dr Mahathir has in recent interviews criticised the 1962 water deal as "too costly" and "ridiculous", and said Malaysia would approach Singapore to renegotiate the terms of the deal. Dr Mahathir had served a previous stint as prime minister from 1981 to 2003. Singapore's Ministry of Foreign Affairs (MFA) said last month that Singapore has been clear and consistent in its position that Malaysia lost its right to review the price of water under the 1962 Water Agreement in 1987. MFA said Singapore's position was set out in Foreign Minister Vivian Balakrishnan's remarks in Parliament on July 9 where he said Dr Mahathir had noted in 2002 that Malaysia did not ask for a review when the water pact was due as it knew any revision would also affect the price of treated water sold by Singapore to Malaysia. The water issue has been brought up on several occasions in Malaysia since the PH government took over. Last month, Johor Menteri Besar Osman Sapian said the state hopes it can raise the price of the raw water it sells to Singapore after discussions with its southern neighbour. In the same month, Datuk Saifuddin said his country will honour the water agreement with Singapore while seeking to restart negotiations on pricing. KUALA LUMPUR • Malaysia's relationship with Singapore is unlikely to be affected by Malaysian Prime Minister Mahathir Mohamad's recent suggestion that the price of water sold to the city state be raised by more than 10 times, his deputy said. In an interview with the Malay Mail published yesterday, Deputy Prime Minister Wan Azizah Wan Ismail downplayed Tun Dr Mahathir's remarks, saying that the water issue is "nothing new" and has been ongoing for decades. "His approach is his approach. Dr Mahathir has a different style in handling things, but at the same time Singapore is our neighbour - they understand us in a way. So as neighbours, we should be cordial. The issue of water has been long-standing," she said. "It is nothing new. Singapore understands that and how to tackle (the matter)." Under the 1962 Water Agreement between the two countries which expires in 2061, Singapore is entitled to draw up to 250 million gallons a day (mgd) of raw water from the Johor River at 3 sen (1 Singapore cent) per 1,000 gallons. Meanwhile, Johor is entitled to buy 5 mgd of treated water from Singapore at 50 sen per 1,000 gallons. Singapore has said this price is heavily subsidised and below the cost of treating the water. Dr Mahathir said on Monday he wants to increase the price of raw water supply to Singapore by more than 10 times to reflect the higher cost of living. He made similar suggestions in 1987 and 1998 - during his first stint as premier - but Malaysia chose not to review prices. 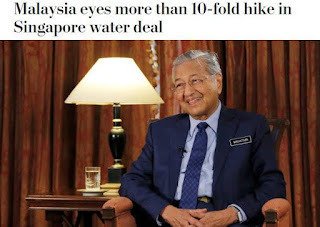 The decades-old issue cropped up again in June, a month after Dr Mahathir became Prime Minister for the second time, when he described the price at which Malaysia sells raw water to the island Republic as "ridiculous".